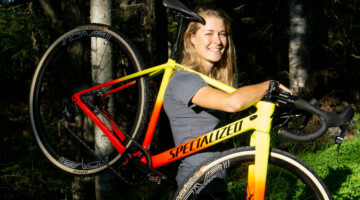 Cyclocross Magazine: Every time your name comes up in a cyclocross conversation, it usually precedes the shock and disbelief that you are both a full time athlete and a full time Spanish and French teacher. Where do you find the time and energy to devote yourself to both careers? Crystal Anthony: Genetically, from my mom! She goes nonstop and has been ever since she began raising the seven of us. While it is hard enough to imagine feeding nine people on a daily basis, she went the extra mile to make her own bread from her own hand-milled flour and the list goes on. But, seriously, I guess it’s both a challenge and a blessing to have two “careers.” My students’ assignments are probably some of the most well-traveled pieces of paper since I’m often grading them on the way to and from races on the plane. I mentioned in one of my blogs that my coworkers often laugh when they ask about my weekend as I’m sure to say something like I was in Colorado, or maybe Europe. And likewise, my cycling friends laugh when they ask when I’ve flown into a race as it’s bound to be something like last night at midnight. With the constant time-zone changes and the inability to sleep in on Monday morning after a travel weekend, I tend to be, um, hyper-conscious about sleep, nutrition, and hydration. Since I would be heading to bed when my housemates were just getting ready to go and have fun, one of them, fellow cyclist Shawn Milne, bestowed me my favorite nickname “The Incredible Sulk.” That is exactly what I turn into if I don’t eat and sleep enough! At the same time that there are challenges, it’s a real treat to be able to balance the physical, competitive demands of cycling with the creative, collaborative demands of teaching. During the week, it’s about the kids and using my skills to help them; on the weekends it’s about being the best I can be on the bike and using my skills to win. I started a cross club for students this past year and I’ve also done some presentations on my travels for our International Week event. In the end it keeps me balanced. Most elite cyclists I know have to work outside of cycling, so I know I’m not the only one who has to juggle both. CXM: A lesser known fact in the ’cross community is that you also run marathons, and not just as a hobby, but you are pretty competitive as well. Do you still have major aspirations as a runner? CA: Haha. It has been a while. I still think the marathon is the hardest race I’ve ever done! My great riding friend Andrea Smith just ran her first recently, so I was reminiscing of marathon training. Actually, I began my endurance endeavors with the marathon, and missed qualifying for the Olympic Trials in 2008 by just 16 seconds. After that, I picked up biking and swimming and raced triathlons for two years, one season as a pro. I made it to the World Championships for the 70.3 but my swimming was not up to par with my cycling and running. My bike was the last one dangling from the rack when I came out of the water, though I made up enough time on the bike and run to end up 20th overall. At the time I was having the most fun on the bike and decided to jump into some ’cross races and I’ve been hooked since. I’m not sure about doing another marathon – maybe someday – but I would love to try some XTERRA events. 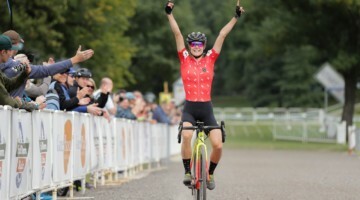 CXM: Back in August, when you were off winning endurance mountain bike races, did your beginning of the season goals include making the Worlds Team? And would you have been surprised with this result? CA: I first set my sights on making the Worlds Team last season. 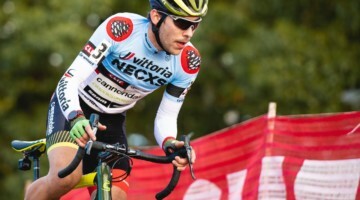 At the beginning of the 2012 cross season, I was surprised as much as anyone at how well I was riding. After winning six UCI races, I decided to make the effort to make the team and traveled to as many C1 races as I could as well as to Europe over Christmas to race my first World Cups. Even with a fifth place at Nationals last year, I came up just short of the team, so making it to Worlds has been my goal since then. The mountain biking was all with the ’cross season in mind. Racing in the TransAlp mountain bike stage race through Germany, Austria and Italy in July, which entailed 37 hours and 66,000 feet of climbing in eight days, gave me a solid base to bring into the season. Even though I probably started the season a bit slower as a result, I like to feel I have that endurance in me when ’cross starts in September. I was confident that I could make the team. CXM: Optum Pro Cycling p/b Kelly Benefit Strategies includes a lot of talent. How has it been riding for them? CA: It was a real honor to join them this past year, both because they have such a strong, talented squad and also because my brother races for them professionally. Being part of Optum is like joining a family in many ways. Beside that, the financial support is amazing as traveling, race fees, and constant bike maintenance are incredibly costly. Also, with the full schedule I keep the ease of showing up to a race with everything set up in a tent is huge! It takes so much stress off of travel and allows me to focus on racing. They have stepped up to help me get to Worlds too, for which I’m very grateful. They have really been instrumental in helping me get to the next level. CXM: You rocked Namur with a top 15 placing! Can you tell us how the race played out? CA: Funny, the race itself is a bit of a blur as my travel adventures getting there pretty much overshadowed anything else. I got stuck in Montreal en route to Belgium, and only made it to the race course two hours before it started with my bikes still packed in the case! My gracious Belgian hosts Glenn and Tatjana helped me throw everything together and get me to the start line in time, and I was running on pure adrenaline. I had a bad start but worked my way up to 13th position over the course of the race. It’s my favorite course with its terrifying descents, crushing climbs, and plentiful mud. I fought extra hard because after the ordeal getting there I wanted to make it count. One woman passed me in the last lap and I finished 14th, but that was my best placing in a World Cup to date. CXM: We have heard rumors that you love long and intense training sessions. After teaching is thrown in the mix, what does your typical day look like? CA: I work from 7:30 to 2:35ish, and an extra hour on Wednesdays. Then I zip home, kit up and ride. If I’m really organized, I’ll get everything out and ready before I go to work so I can walk in the door at 2:55 and be on the bike by 3:05 to catch every drop of sunlight I can! However, in the later fall and winter I do most of my long training on the weekends. After that, I enjoy cooking dinner and catching up with family and friends. Sometimes my friends Jordan and Don and I trade cooking for each other, which is fun. I’ll also host “raw night” so my girlfriends and I experiment with making dessert and pizza and tacos and such out of things like cashews, coconut oil, sundried tomatoes, etc. Or sometimes we’ll just ditch that and eat ice cream. One of my favorite treats is hacking open a young coconut and making a smoothie out of it with nutmeg, cinnamon, and vanilla. Then, as I said before, the Incredible Sulk usually goes to bed pretty early. CXM: Your family is also well-known in the cyclocross community. What roles have they played in your success growing up? CA: Initially, they scared me away from ’cross! Haha. 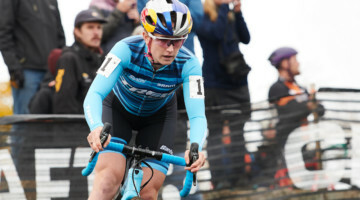 With Josh and Jesse’s incredible success as juniors and U23s it was pretty daunting to be the “Anthonys’ sister” and venture onto a ’cross course. At the same time, they included me on many fun adventure rides and their enjoyment of the sport was contagious. I loved watching them race too. My dad had also ridden his bike across the country in the 70s and I always thought that was pretty cool. Once I decided to start dabbling in cycling, both Josh and Jesse helped me with tips on technique and training and race strategy. Of course, the past two seasons Jesse has been officially coaching me and has really helped me hone my skills and fitness. He’s analytical and thoughtful and knows me really well so it’s a good fit. My parents are super supportive too. They come out to a lot of races to cheer, including flying out to Nationals, and are great moral support. Caleb and Silas have helped with mechanic work too. Kidding aside, I’m really proud to be the third Anthony sibling to make it to the Cyclocross World Championships! I wonder if there have been any sets of three siblings to do so before? This will be the family’s 10th trip to ’cross worlds, I believe, and our 13th trip to a World Championship event since Jesse also competed twice in TTT Worlds and I at 70.3 Worlds. 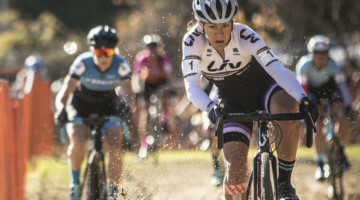 CXM: With your range of your athletic talents, what continues to draw you to Cyclocross? CA: Both the people and the challenges of the sport. From my family, to my Ladies First, then Cyclocross World and now Optum teammates, to the other competitors, it’s a great crowd of folks that are crazy enough to get muddy and ride in everything from the dark to snow! Also, every course and race presents a new challenge. I like that it requires all-out effort as well as skill. It’s a rare combination of the two in one sport. CXM: After traveling extensively this year, how do you feel New England cyclocross compares to the other areas of the United States? Europe? 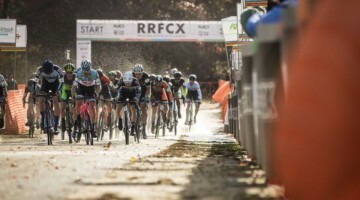 CA: New England is the next best place after Belgium to live for cyclocross. Growing up in New England, I’d not only get to join my brothers on rides but also other North Shore pros like Tim Johnson and Shawn. The number of quality races we have within driving distance is better than anywhere else in the country. The talent at New England races is fantastic and grows every year. 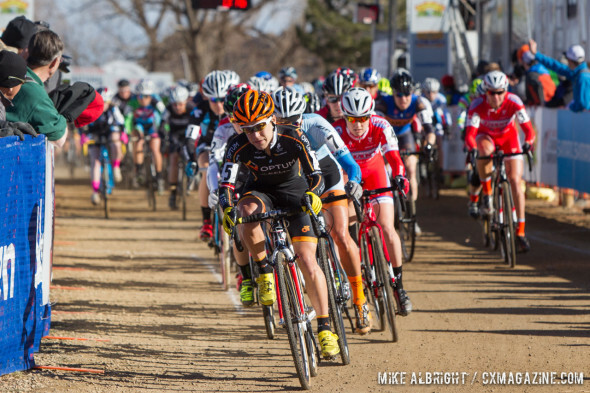 CXM: What are your expectations for the 2014 World Cyclocross Championships? CA: I go in ranked 17th and would love to place top 15 or top 10. However, I’m just going to prepare as best I can and ride to the best of my ability and enjoy the experience. Ever since I was a kid I dreamed of going to the Olympics. Since ’cross isn’t an Olympic sport yet, wearing the Stars and Stripes this weekend is the next best thing and pretty much a dream come true!